Before the beginning of the next financial year, say April in India, October in US and January for many other countries, business leaders across sectors deploy the next year’s targets to their teams. In India, most organizations do this in March or some in early part of April. This is not sufficient and I’ll explain at the end, why? Usually this approach is top-down and straight forward. The CEO and Business Unit Head agree on target numbers and those are deployed to rest of the team in Sales, who are split by geography (territory mapping) and, in some cases by product or service lines. The unfortunate truth about the reason for failure or non-achievement of targets is that most business development leaders focus on target deployment and not on ‘means’ deployment. 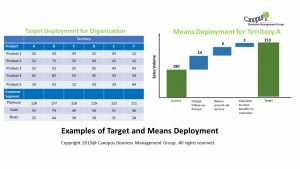 Target deployment includes breaking the target by geography and product and assigning it to various teams and individuals. This is illustrated in the image. ‘Means’ are nothing but the approach or sales strategy to be used to achieve the goal. Firstly, most business development (BD) leaders and salesmen, think that by running harder and following up harder, they will achieve their goal. Usually, such tactics can at most add 10% to sales and that too, when they are lucky. So, what the sales teams need are practical ‘means’ or approaches. Don’t confuse this with ‘strategy’, which is a heavy word and most often misunderstood. The term “Sales Strategy’ is grandeur and evolves some kind of mega and disruptive game plan. This is one reason which most sales teams switch off when their leaders talk of sales strategy. Some of these can be common, organization-wide ‘means’ for sales that have to be identified and implemented centrally and there will be few territory level ‘means’ that have to be identified and implemented by territory teams. An annual sales strategy planning workshop should focus on identifying the gaps in the existing system and thereby identify ‘means’ to be adapted. It will also require field research, understanding of customer pains, competition mapping, gathering internal and external constraints or vulnerabilities. Next will be grouping (affinitize) issues or problems that have to be Usually, teams will come up with too many issues. For prioritized issues, teams will generate broad themes or ‘means’. Now teams will realize that they need support from other functions such as marketing, HR, partner management, business planning, product development, supply chain, IT, etc. to implement the means. All the above steps require very strong facilitation skills. Teams should never to put up pressure of authority and should be given a free hand for theme identification. A neutral person with good facilitation skills should lead this activity rather than the boss. Bearing in mind that the above activities require field insights, participation and agreement of all stakeholders, who in turn need time commit resources, etc. The Annual Sales Strategy Planning Workshop needs at least 3 ~ 4 weeks of preparation time and 2 to 3 days of group workshop to be ready before the commencement of Financial Year. Ideal time would be to finish it 2 months ahead of the commencement of next FY. However, if the organization isn’t complex, then it can be commenced 1 month ahead as well.